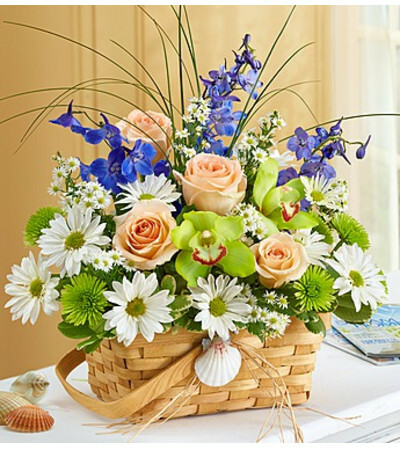 Like a fresh-picked basket of wildflowers, this brilliant arrangement brings the beauty of Summer inside. Gorgeous roses and delphinium, cheery poms and monte casino, and tropical Cymbidium orchid blooms, all gathered fresh by our select florists in a handled basket, will instantly brighten up birthdays, beach parties or "miss you much" days. 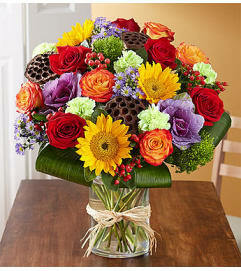 Long-stem roses, Cymbidium orchid blooms, delphinium, poms, bear grass, monte casino and variegated pittosporum. Hand-designed in a 9.5"L splitwood handled basket with liner; accented with hand-tied raffia and a decorative seashell. 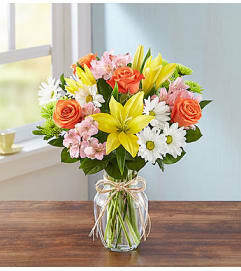 Standard arrangement does not include Cymbidium orchid blooms.